The list below is a selection of stocks that are very expensive to short. 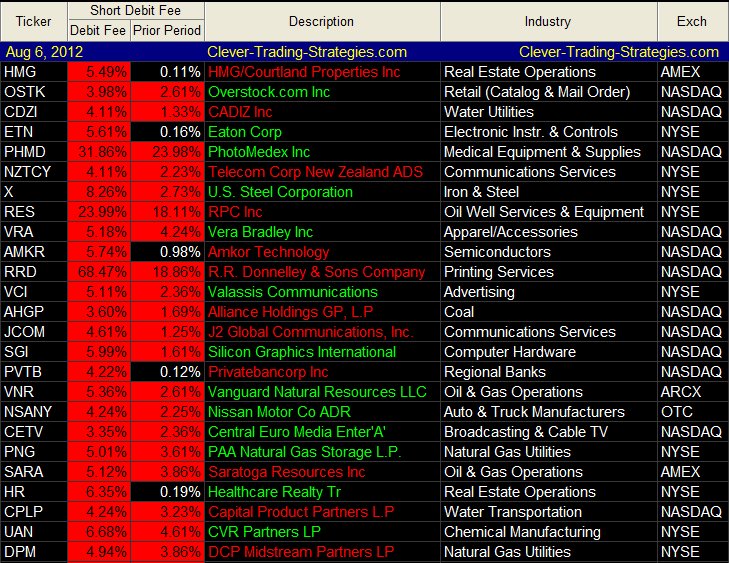 The interest rate cost for borrowing these stocks is highlighted in red. These stocks are in short supply and it will be difficult to find large quantities of shares available for shorting when the stocks are dropping. So in order to obtain enough shares for shorting, you will need to short the stocks prior to its down move. Unfortunately, the interest costs for holding these stocks are very expensive. This creates an opportunity to profit on short covering rally. The interest rate is set daily and there is no ceiling on how high the interest rate can be. This creates uncertainty for the holders of the shorts. Every time the interest rate jumps up an additional 10%, it causes a round of short covering. The short covering usually lasts from two to three days. You want to wait for the stock to come to a popular and easily seen resistance point. The stock will stall below the resistance level and invite traders to establish their short position. What you will be looking for is an overnight jump on the interest rate for borrowing the stocks and a Gap Up to take out the previous resistance. You now have a short covering rally underway. It usually last two to three days as the shorts winces from the high interest rate for holding onto their stocks and decides to cover. Please remember to bookmark this page. The interest rate for borrowing stocks fluctuates daily and the list is subject to change depending on the interest rate. During Bear Markets, the list will change more frequently. Remember to check back often to see new additions to the list. For complete listing of more stocks with high borrowing fees, please login to Premium Members webpage.